Anyone who's actually got this issue? 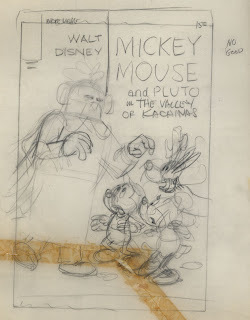 It contains some Paul Murry illustrations that I'd like to see. 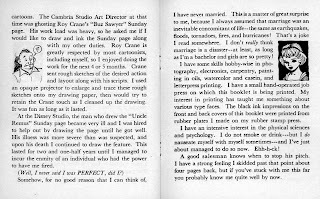 Allan Holtz has posted some beautiful TS Sullivant drawings over at his Stripper's Guide, earlier this week. For some strange reason I haven't checked his blog for a few days. Shame on me!!! Good stuff posted there all the time . 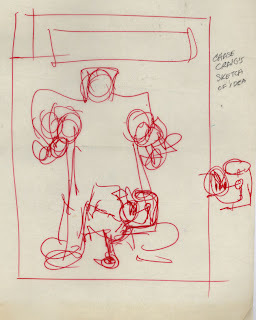 Ever wondered about the different stages when an artist plans and layouts a cover? 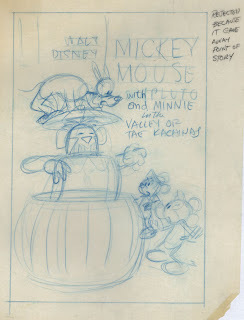 Here are Bill Wrights cover roughs for Mickey Mouse 142. First out are some false starts. Just rough pencils drawn trying to come up with an idea. Then we have the pencils submitted to the editor. 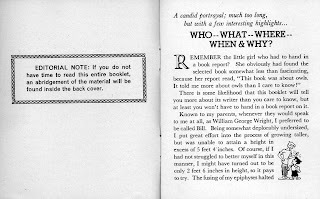 It's a strong and appealing cover design but as the margin notes says; it gives away part of the story. Thanks to Germund Von Wowern for allowing me to post these from his collection, and to Don Ault who made sure these were saved for us to enjoy! PS. The stuff I promised last tuesday will have to wait a day or two more. A little too busy to scan right now. Sorry. I'm finally getting ready to leave work for today. My friend Germund von Wowern will join me to the studio to scan some rare material wich I'll post here later. What it is? 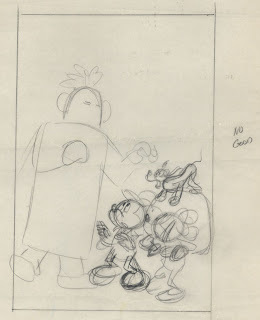 A set of unpublished Bill Wright cover sketches!!! 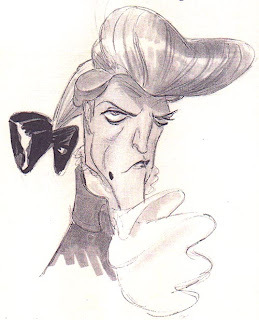 Havn't seen them myself yet so I'm just sitting here waiting that he will finish his work over at the Disney dept. Bill Peets storyboards for the Tar baby sequence in Song of the South! 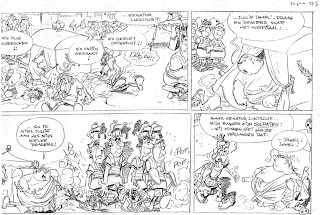 The great Kremos - The Art of Niso Ramponi. Seems that this is another "must have" book, coming in 2008. 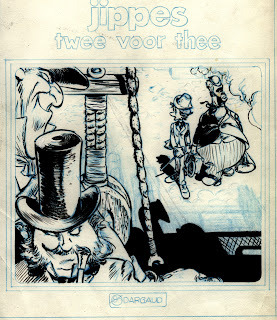 Here's a follow up to the last post with Daan Jippes artwork. 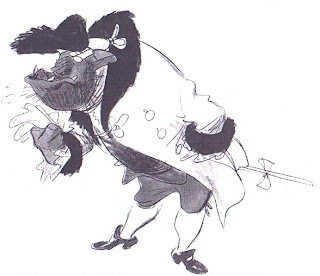 First some Beauty and the Beast sketches featuring Gaston and the Beast. A drawing from a letter he sent me. A rough for the Tea for Two album. 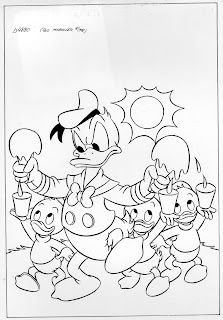 If you want more there's of course the special issue of Danish Carl Barks & Co. filled with Jippes non-Disney artwork. Might still be available. PS. 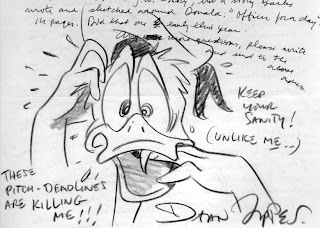 As an extra bonus, here's a childhood drawing by Daan! Enjoy! Just saw these incredible layouts and the finished page by the great Daan Jippes. Currently for sale from Galerie Laqua in Germany. 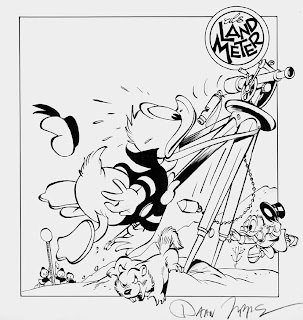 Laqua also has a good selection of covers and pages with the Disney ducks for sale. Damn he's just way too good! 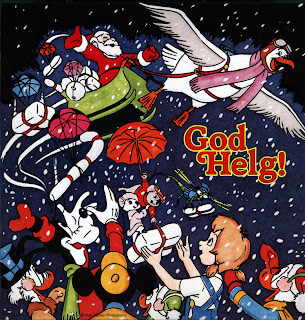 And the Swedish Donald Duck weekly has been running lots of covers and new (!!!) stories drawn by him lately. Always a pleasure to see new artwork by him. It inspires me to draw. It's like an ink injection that makes me run to the drawingboard. Very few artists have that effect on me. Daan is sure one of them. I know it's still a long time until Christmas but I couldn't resist putting this seasons greetings card up. It was sent out by Hemmets Journal AB. Probably drawn with felt tip marker. I've been collecting Bo Michanek artwork for around ten years and I've come across many odd and unusual items drawn by him. 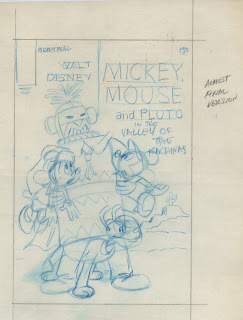 Next a cover drawing from June 1978. 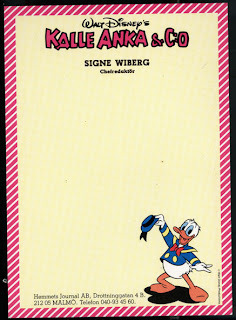 It was used in Sweden as a sticker in 1985, but I don't think it was used as a cover. This scan is from a copy I made many years ago. This is also from a copy. Probably from the early 80's. As you can see his brushwork is much more slick. It's just amazing how good this piece is inked. Every line shows wich confidence he had when he inked this. 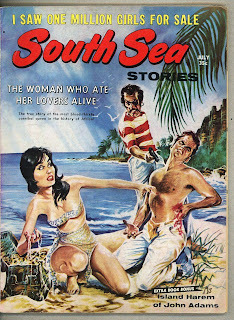 I wonder if it was ever published. Now it's time for me to hit the sack. 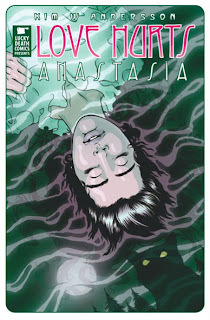 Love Hurts "Anastasia" by Kim W. Andersson! 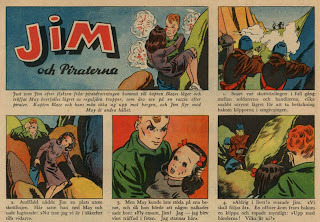 Released as a supplement on glossy stock in the latest issue of Swedish comic book Nemi. For a step-by-step on how the cover was made see Kim's homepage. Link can be found in the list of links to the right. 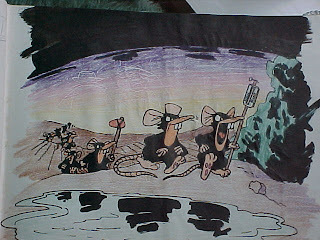 I've seen tons of cartoonists photos but few are as charming as this one. Milton Caniff in a 1947 photo. He had just launched his new strip Steve Canyon and life must have been good for him. 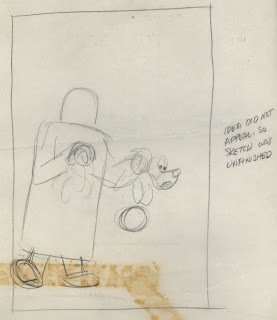 An update with some rare and unseen Disney artwork! 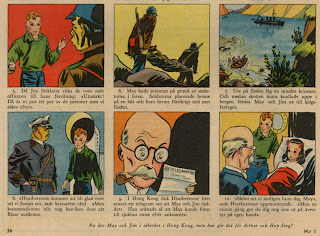 If you are a fan of Milton Caniff's Terry and the Pirates ("Jim och piraterna" in Swedish) you might have heard that during WWII other hands were involved in producing an european version. My guess is that the proofs/stats at some times never reached Europe because of the war. What to do then? 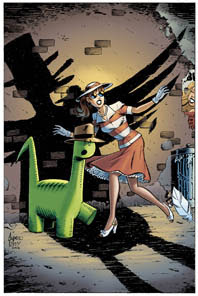 The answer was to continue the stories by doing new art and stories with Terry. Here's a rare example. The very first one I've seen after searching for years. It appeared in the weekly magazine Allers #1 1941( January 1). I've checked to see if it was just a redrawn version of an american page but the story doesn't seem to fit in anywhere. Does anyone know who did this? For how long? 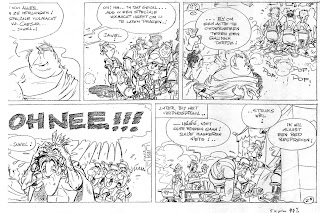 Does anyone have more examples of this crude but interesting version of Terry and the Pirates? Sorry if this blog hasn't been updated often this week. I've had a cold (and I still do) and have packaged what feels like a million parcels for stuff I've sold on auctions, that has yet to be weighed and sent out. And Iv'e been working as usual. But I've got some stuff for this weekend so check back then. Right now I'm in the studio, waiting for some microwave food to be ready. Actually it's a note written on one of the many sheets of pasted up Mickey Mouse dailies that he left behind when he passed away in 1984. Myself and my friend Germund has a big stack of proofs for Mickey Mouse, Brer Rabbit etc that he once owned. But there are stuff missing. Anyone else who has parts or maybe the rest of his collection? 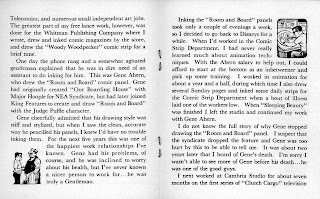 Anyhoo, here's a sample of his paste up pages featuring samples of Floyd Gottfredsons work late in his career. 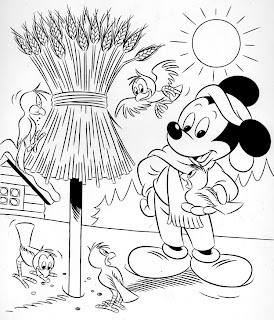 Myself I think Gottfredson did the pencils on that particular daily but it was inked by someone else. It's certainly his lettering. Any thoughts? Hello everyone who reads this blog! 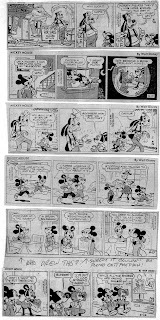 I recently ended up with an extra set of Floyd Gottfredson's 1956-1957 Mickey Mouse daily strips. I thought I should check if there's anyone interested in this set? Ca. 100 large sheets with a weeks worth of strips per page. 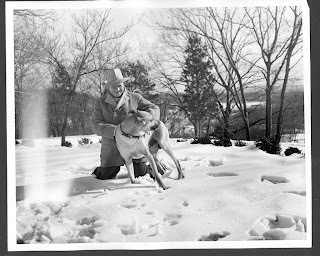 (Missing January 1956. And some weeks are missing a daily. But most are complete weeks. Sharp from proofs.) 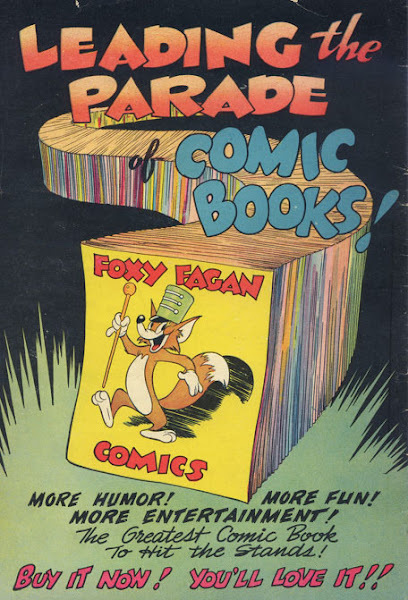 These are not in the German Floyd Gottfredson portfolio wich covers 1930-1955 and will most likely not appear in any upcoming Gottfredson library since these are after his "adventure period". 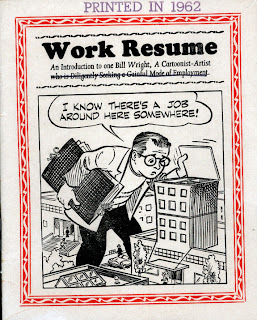 Written by Bill Walsh they feature corny and sometimes surrealistic and weird gags. 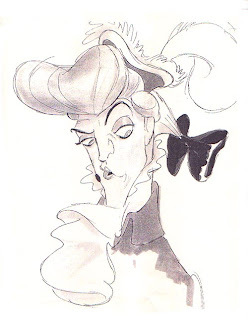 :) And naturally Gottfredsons strong sense of design. I enjoy just flipping through these sheets and beeing inspired by his artwork. 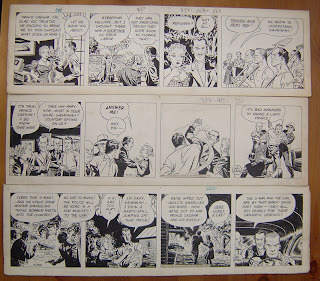 He even inked these himself, even if I see a few dailies that are inked by Bill Wright. 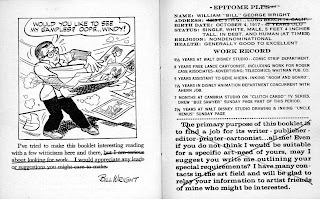 Bill Wrights (1917-1984) work resume! 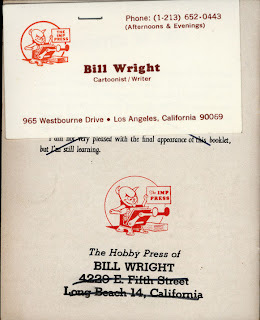 Now, who was Bill Wright? 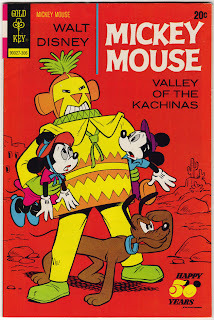 If you are interested in the history of Disney comics and newspaper comics you probably already know. If not, please read about him in his own words. It's fun and interesting reading. Don't skip it. 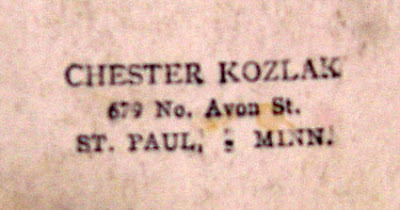 This edition was printed in only 325 copies for the National Amateur Press Association (That's the info covered up on the back by his business card.) and maybe the original was printed larger than this rather small edition. And the worst thing is that he'll continue to put it on his blog. Don't tell me I didn't warn you! Myself, I'm still having a cold. Just don't get any better but today I have at least been able to ink a while and will try to write a script or two. Hopefully I'll be able to lay my hands on the new Terry and the Pirates volume later :) and maybe some other people will come to the studio and cheer me up. Let's hope so. But now it's time to walk over to Indian Express to grab some lunch! 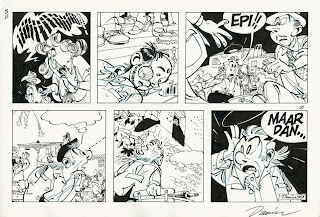 It's time to update my Comicartfans.com gallery. Something wich I haven't done in a while despite the fact that I've been buying stuff all the time. But you, my loyal followers will see the new stuff first. First out are some real gems by Swedish artist Rune Andréasson. 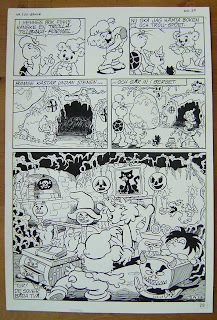 Here we see a page from his last comicbook story "Bamse i Trollskogen", from 1990. This story was actually written back in the seventies as a shorter leadstory for the BAMSE comic book. However he decided to make a movie out of it and I've seen storyboards dated 1981. The film was released in early 1991 if I remember right. It took him 15 years to get that movie/comic done!!! I should add that he and his wife drew and hand painted the whole movie themselves at the same time as they did a monthly comic book... Other people drew the comics, but still. Then we have two dailies from the 50's and 60's. 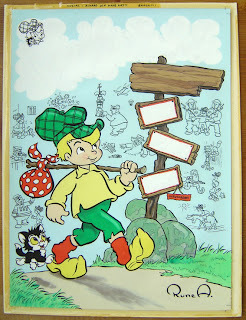 Rune did Brum for many, many years. Again I was able to pick my two favorites of the more than thousand strips made. They are very different both in size and the way they are made (Brush vs. nib.) but I love them both. 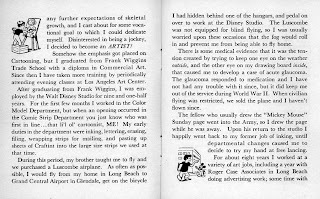 And lastly, my three X-9 dailies from 1942 by Mel Graff. Got the last one by mail yesterday. Two of these also have stamp on the back of the art. 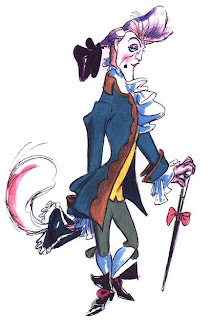 Does the name Chester Kozlak ring any bells? Wait, hold on a second! I'm not finished yet!